This end of my counter is not usually so cluttered* the photo is to show you the mess one single cafetiere can make when the beaker bursts! It happened suddenly and the liquid went everywhere. Over my trousers and my shoes, on the counter, across the floor, on the sides of the cooker and the washing machine beside it. Can you see the hole at the bottom of the Bodum® cafetiere? It is just behind the upright bar with the name embossed on it. I found the larger piece of glass on the floor at the side of my cooker when cleaning up the mess. I have been a Bodum® customer for many years now. I have an Assam Tea press and cafetières in several sizes, that are in regular use. I am very careful with the glass and always wash & dry each one by hand, I do not have or ever possessed a dishwasher. This break was spontaneous, and the first time it ever happened to me! I decided to get in touch with Bodum®, explain my problem and I added photos for evidence purposes. I asked if there was a reason why this should happen when, instructions are followed to the letter? I had an immediate reply! It would seem to us that your question is answered in the photographs you have provided. It would appear from the first to [sic] photographs that a metal spoon was being used. In the third photograph the instructions for use are shown where it states that coffee should be stirred with plastic or wooden spoons not metal. By this stage my glass beaker was in the bin, so I immediately went to look at the larger sizes in my cupboard. They do not mention anything about metal cutlery, one way or the other. I then went rummaging in the bin for the object of my complaint. The print on the glass is smaller and in a place close to the handle, so more difficult to read. Why must the print of what is considered to be an important issue, be so small? I have taken another photo of three cafetieres. The tissue in each is to make the print more readable. I did write back, admitting that I had not read the instructions, as I had been using the cafetieres successfully for many years and did not expect them to have changed. I did wonder if there has been a recent spate of problems and the small instruction about the non use of metal cutlery was to cover the company in these days of a compensation conscious culture. I made no suggestion of compensation. I was not burned. I only wanted to let them know of my disappointment. I grew up in the days of china cups and fine glasswere. My mother taught me to use a metal spoon when pouring hot liquid into a glass or china cup, to diffuse the heat and prevent the glass/china cracking. 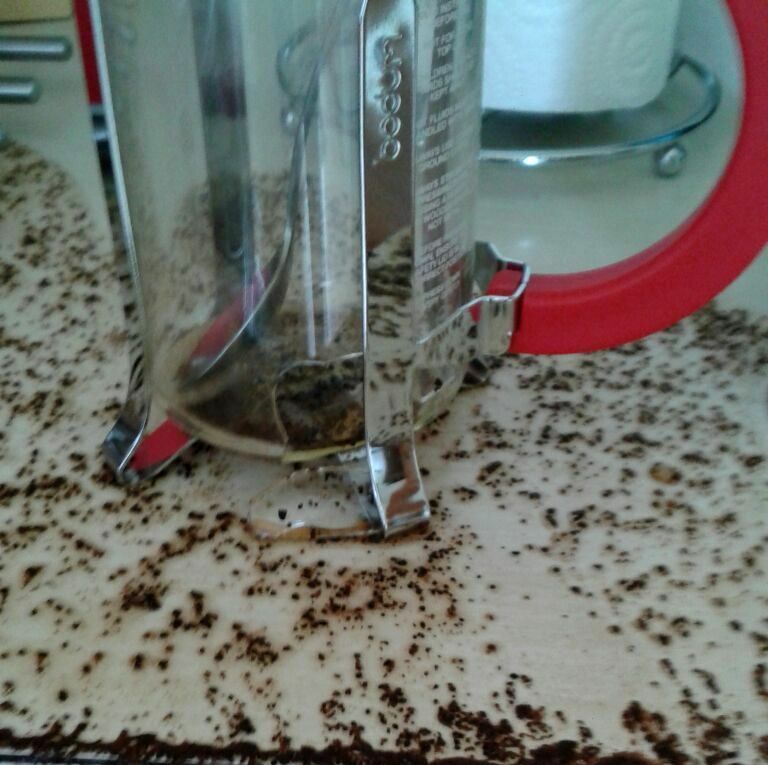 I have done that for over fifty years without a problem, even with Bodum® cafetieres. Now go back and take another look at the last photo. The single one with the broken glass has a metal frame, while the others are made of plastic. If it is not considered safe to use a metal spoon inside the glass, surely it is not a good idea to market them with a metal frame. With each purchase of a Bodum® cafetiere, I found a plastic measuring spoon in the pack. Perhaps it might me a helpful marketing idea for Bodum® to switch the measuring spoon for a long handled plastic spoon with the brand name on it! 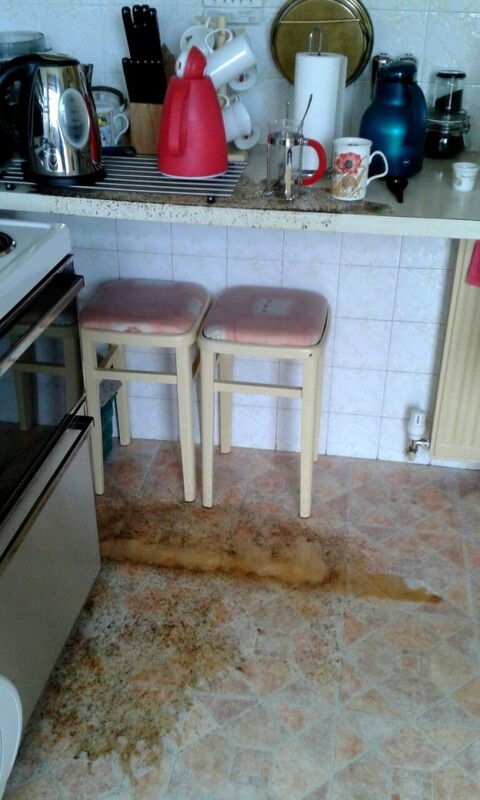 * My Microwave had to be moved a couple of weeks ago, when water began dripping through my ceiling ( a story for another day). It is now on the far end of the counter and I am waiting for help to set it back up on the wall brackets. My arms can no longer take the weight and lift it up onto the wall brackets, while standing on a step ladder. Grrr! This entry was posted in Beverages, handy hints and tagged Bodum®, Broken glass, coffee, danger, Handy hints on March 30, 2015 by Grannymar. I have three versions of coffee makers. One just an ordinary gravity filter to make the famous South Indian Filter coffee, the other an Italian espresso machine in aluminum and an electric one with metal collecting can and plastic steamer. None of them are likely to give me the kind of trouble that you have had. In any case, unless some visitors come, I have one mug of coffee and the rest of the time have tea. I rest my microwave and the OTG both on top of a side board in the dining room as there is simply no room in the kitchen. Ramana, I have the microwave up on the wall at eye level, and the space below can be used as a shelf. It suits me well. My dining room is compact and there would not be suitable for a sideboard. A high narrow wall unit sits between the dining and living room. I did hace a drip coffee maker , but ditched it some time ago. I do not use instant coffee, for some reason it does not agree with me, so a cafetiere is ideal for my purposes. I feel your frustration, Grannymar. I too remember being taught that metal spoons divert heat. Anyway, not that it’s any comfort: Life is too bloody short to enter into futile exchanges with companies. They are so anxious to defend themselves they don’t actually listen to any (in your case) valid point to stop this happening to some poor sausage in the future. You mention dishwashers. As an aside, considering that both you and I appear to have been our mothers’ right hands and sometimes two: I never minded doing the washing up for our rather large family. I never felt put upon. It was just the way it was. And my sister (if and when she was around to do the drying) and I would sing many a merry song and have a grand time. HOWEVER, and it still hurts decades down the line, no sooner (like the next day) I had left home my parents bought a dishwasher. Ursula, I spoke to my sister the other day and she too remembered mammy using a spoon to difuse the heat. I am not afraid to let my problems be known to companies I am unhappy with. In the past I engaged with Kraft Foods and had a situation changed to the benefit of all employees and at a later stage with Calvin Klein, and came away with a very satisfactory result. When I pay good money for something, I expect it to be up to standard. Ursula, we did the same thing after our girls left home. I don’t think they resented it as they know how much I hate to do dishes (bad memories of my mother’s nasty kitchen sink when I was small — not logical, I know, but it is what it is). That was over 20 year ago and the dishwasher is on it’s last legs. What a disaster! Thank goodness, the broken glass did not hit your eyes. Fortunately, Gigi, the liquid and glass shot out at waist level and from there to the floor. That’s a messy situation to deal with . . . especially if you haven’t yet had a cup of coffee!!! Glad the hot liquid and broken glass didn’t burn or cut you. It totally changed my plans for the day! We’ve had several Bodum cafetieres and we always use metal spoons to stir the coffee. We’ve never had any cracks in them. And I’ve never seen any warning about using metal spoons. I think they’re just trying to escape responsibility for a manufacturing defect. And yes, we always use metal spoons in china cups and have never had any breakages. Nick, I have not given up yet, I am still hoping for a reply to my last email. I will keep at it. I have linked to them in this post, so hopehully they will see that and take note! Quite a mess. We use a coffee brewer that dispenses into a metal thermos carafe. It’s not going to break, but if we don’t make sure that the carafe is empty before brewing the next pot, it, too, makes a mess. I did have a drip coffee maker, some years ago, but the cafetieres are better suited to my needs… When they do not explode! I don’t believe I’ve ever seen that brand of coffee maker here in the states. I just use a Mr. Coffee drip model which never breaks. However, that doesn’t mean I can’t flood the kitchen with java. More than once I have started the process without putting the carafe back in its place. Al, they are a Danish company with offices in many countries including New York. The drip feed coffee makers here in UK & Ireland have a little valve that prevents the coffee dripping until the jug is set in place. VERY interesting reading & pictures. Thanks for the warning. This is an example of Murphy’s Law. What can I say? It happens to us all, but the company that makes the darn thing should do a better job of answering your complaint. GRRRRRRR! BHB,I have not given up hope of another reply, yet. Perhaps they are thinking about the best way to deal with the situation. We have Bodum brand here, but in the main these gadgets are called “coffee plungers” here. 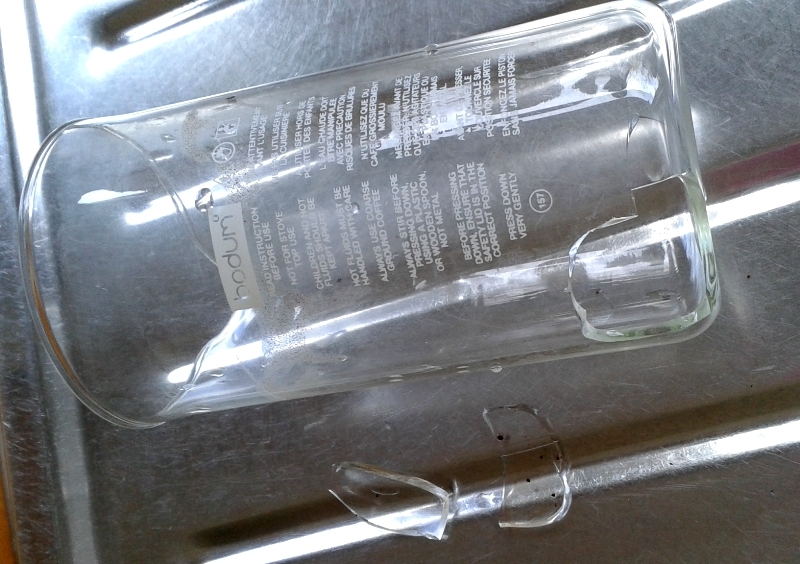 nearly all my coffee plungers have broken though something happening to the glass canister – apparently it is possible to replace such items on certain brands…a good kitchenware shop should be able to do that. I need to go to Belfast or Dublin to get a replacement beaker, but I am not sure I want to use the metal frame again. It will be plastic frames for me from now on! 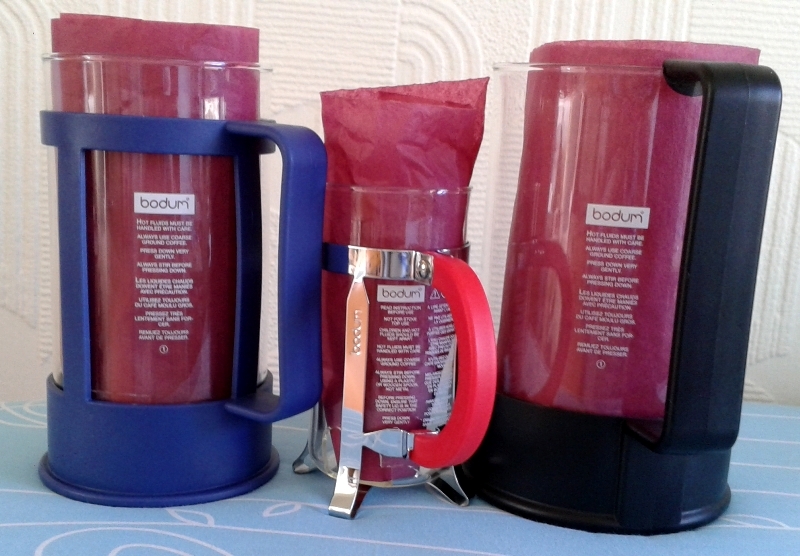 Your Bodum went bad – BA-DUM! The art of making coffee, for me, is taking some brown powder and dumping it in hot water. That brown power (instant) make me cough! *very kind voice* Dear, you are supposed to dissolve and drink it, not inhale it!